Is the God who created us better than the God we've created? After following Jesus for nearly two decades, Jonathan Merritt decides to confront the emptiness of a faith that has become dry, predictable, and rote. In a moment of desperation, he cries out for God to show up and surprise him, and over the next year, God doesn't disappoint. In JESUS IS BETTER THAN YOU IMAGINED, Jonathan shares vulnerable, never-before-shared stories of how he learned to encounter Jesus in unexpected ways. Through a 60-hour vow of silence in a desert monastery, he experiences Jesus in silence. When a friend dies of a rare disease, he sees Jesus in tragedy. Through confronting childhood sexual abuse, Jonathan discovers Jesus in honesty. In an anti-Christian-themed bar, he finds Jesus in sacrilege. And when he's almost kidnapped in Haiti by armed bandits, he experiences Jesus in the impossible. Though Merritt finds himself in places he never dreamed of, he doesn't lose his way. Instead, these experiences force him back to the Bible, where he repeatedly offers fresh, sometimes provocative, interpretations of familiar passages. Along the way, he throws back the covers on the sleepy faith of many Christians, urging them to search for the Holy in their midst. Pointed and poignant by turns, Jonathan helps readers open their hearts to a mysterious God and a faith that sustains, guides, and most importantly, surprises. His fearlessly honest story invites us all to discover the messy mercy and crazy grace of a sometimes startling Savior. 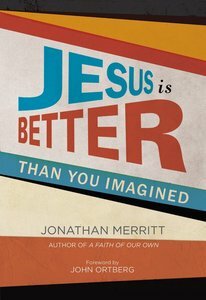 About "Jesus is Better Than You Imagined"
Jonathan Merritt is a faith and culture writer whose work appears regularly in national publications such asUSA Today, theAtlanta Journal-Constitution, andRelevantmagazine. As a powerful Christian voice, he has appeared onABC World News,NPR,and PBS'sReligion and Ethics Newsweekly.Merritt holds a master of divinity degree from Southeastern Baptist Theological Seminary in Wake Forest, NC, and currently lives outside Atlanta, GA. You can find out more about Jonathan at www.jonathanmerritt.com.